Welcome to Hilton Podgorica Crna Gora - a city landmark formerly known as Hotel Crna Gora. Set in the heart of Podgorica, this fully renovated hotel is a quick walk to government offices, embassies, downtown, banks, sports venues and city parks. 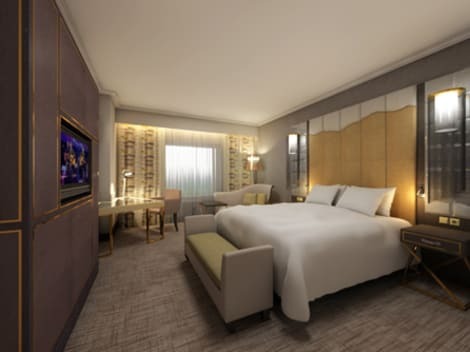 Along with stylish, sunlit guest rooms and suites, hotel guests will enjoy 4 restaurants and lounges including a spectacular rooftop bar, plus gorgeous event space (including the city's largest ballroom), an Executive Lounge, 24-hour fitness and business centers and the city's largest spa. The hotel is also pet-friendly.Settle into a newly refreshed guest room and view Podgorica through oversized windows. Each room has comforts like Hilton Serenity beds, a 40-inch Smart TV, mini-bar, bathrobe and slippers and WiFi access. Choose a suite or executive room for more space, better views, a kitchenette, living area, 48-inch Smart TV, media hub and exclusive access to the Executive Lounge.Hilton Podgorica Crna Gora has some of the largest meeting space in the city. Host up to 14 coworkers in the boardroom, or plan a conference or grand reception in the 425 sq. m. Crystal Ballroom. All event space offers daylight, state-of-the-art A/V equipment and the dedicated support of Hilton Team Members. Overlooking Moraca River, this hotel is located in Podgorica's Novi Grad district, close to the Moraca sports centre. 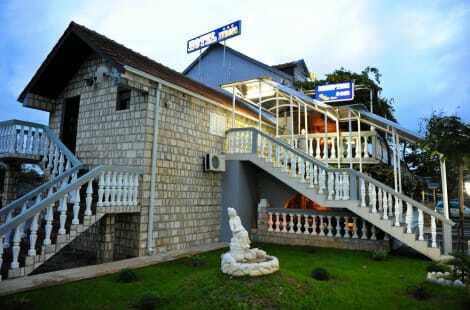 It is only 10 min walking from the shopping malls and numerous cafés and restaurants in Novi Grad. The hotel has 44 rooms and suits, and also offers a modern gym and complimentary Wi-Fi. All bathrooms feature hydro-massage shower cubicles or hot tubs. The common characteristics of all rooms are abundance of light, space, natural colours and materials. All are equipped with air conditioning and minibars. Various drinks and other beverages are served at the Aperitif Bar or at the Just Club. Make yourself at home in one of the 30 air-conditioned rooms featuring minibars and flat-screen televisions. Complimentary wireless Internet access keeps you connected, and cable programming is available for your entertainment. Private bathrooms with showers feature complimentary toiletries and hair dryers. Conveniences include safes and desks, and housekeeping is provided daily. Located in Podgorica, Keto Hotel is within a 5-minute drive of Podgorica City Stadium and Trg Republike. This hotel is 1.6 mi (2.6 km) from Millennium Bridge and 2.2 mi (3.6 km) from University of Montenegro. Located a 5-minute drive from Podgorica Bus & Railway Station, Hotel Kosta’s boasts lavishly furnished apartments with handpicked antiques and pieces of art. It features a spa area and on-site restaurant. All air-conditioned units feature wooden floors and oriental tapestry. Each apartment comes with a satellite TV, CD/DVD player, free Wi-Fi and a hairdryer in the modern en suite bathroom. Kosta’s Hotel spa area includes hydromassage baths, massage rooms and a sauna. Guests can also relax with a book or bask in the sun on the hotel’s sun terrace. Kosta’s offers business and tourist travel arrangements to destinations throughout Montenegro, as well as car rental and airport shuttle services. Free on-site private parking is available. 3 stars Bojatours Hotel, located in the center of Podgorica, has 20 rooms, each with central heating, air conditioner, satellite TV, telephone, mini bar and free access to Internet 24 hour. Within the hotel, there is fitness center (aerobic, sauna and gym) free for hotel guests. Hotel has its restaurant where breakfast is served. There is also Tourist agency, selling domestic and international airplane tickets, and rent-a-car service. There is possibility of guests transport on the relation airport-hotel-airport. Boja Tours Hotel is situated few steps from the center of Podgorica. It's very close to Montenegrin theater, music center and other important places. Podgorica International Airport is 10 km from the hotel. Rooms with central air conditioning, wireless internet, cable tv, mini bar, hair dryer, phone. Services: laundry services, conference hall with 50 seats offers the possibility of organizing business and other meetings. The renovated and modernised hotel is a family owned hotel with special care for every guest. As central city hotel, the place shares the philosophy that is very important to create a perfect ambient for business people. The hotel is very well connected with the main business area, centre of Podgorica and the biggest shopping mall of Montenegro which is only 500 m away from the hotel. Don't miss out on recreational opportunities including a sauna and a fitness center. Additional features at this hotel include complimentary wireless Internet access, concierge services, and wedding services. This hotel boasts a prime location in the new business zone of Podgorica, the largest city of Montenegro, and just 1 kilometre from the city centre, this establishment is ideal for business and leisure travellers alike. It offers a choice of spacious rooms to suit all clients' needs, providing a range of state-of-the-art amenities to offer guests a comfortable and pleasant stay. All the guest rooms offer air conditioning, a flat-screen television and a private en suite bathroom. Clients who have the chance to stay at this exceptional establishment may enjoy the delicious cuisine on the restaurant terrace. Modern and simple, but at the same time notably sophisticated, Hotel Aurel promises a memorable stay. We are delighted to invite you to come and visit AUREL! No matter what the reason of your visit is, we are committed to your ultimate satisfaction. Make yourself at home in one of the 122 air-conditioned rooms featuring fireplaces and flat-screen televisions. Complimentary wireless Internet access keeps you connected, and cable programming is available for your entertainment. Conveniences include safes and desks, and housekeeping is provided daily. lastminute.com has a fantastic range of hotels in Podgorica, with everything from cheap hotels to luxurious five star accommodation available. We like to live up to our last minute name so remember you can book any one of our excellent Podgorica hotels up until midnight and stay the same night.